When Portugal took on Poland in the first quarterfinal of 2016 European championship both team knew they have a wonderful chance of making it to the final as none of the previous winners are in the same draw. Poland were slightly favourite going into the game and they scored in just second minute of the match when Lewandowski scored with a neat finish. Portugal however found a way back into the game when Renato Sanchez scored with a classy strike just from the edge of the box to make it 1-1. As both teams head into the break game is finely poised with both teams scoring 1 goal in the opening 45 minutes. 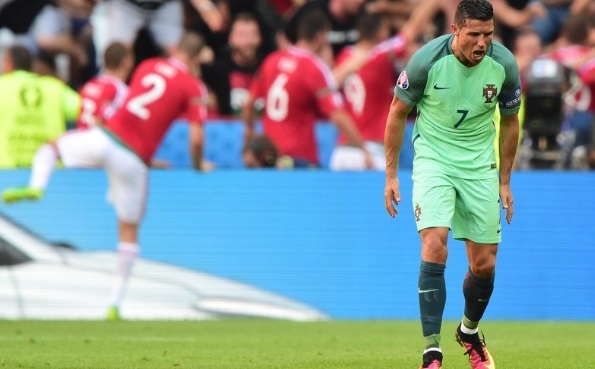 Portugal came to life after a shaky start and looking stronger of the two with another 45 minutes still to play. 02′ 1 – 0 Robert Lewandowski scored his first goal in the euros with a nicely taken finish to make it 1-0 for Poland in just second minute of the game. 33′ 1 – 1 Renato Sanches produced a class moment when he shifted the ball on his left foot and unleashed a pile driver in the back of the net. Match Preview: Portugal drew their opening three group games and bare qualified as one of the best third place teams while a late extra time goal by Quaresma saw them get past Croatia in round of 16. Poland on the other hand has emerged as one of the dark horses in the competition having finished runners up in group C behind Germany only by goal difference while they defeated Switzerland on penalties in the first knockout round. Poland area well drilled unit with a incredible work rate and compact defense. Although their star striker Robert Lewandowski is yet to score in the competition they have goals in midfield. Ronaldo and company will have to be at their best to get past Poland in what promises to be another cracker of a game. If Portugal can put things right and build on their performances they have a good chance of reaching the finals. Ronaldo can break Michel Platini’s goal scoring record in European Championship with two more goals. Both camps are in good shape going into the quarterfinal tie and no fresh injury concerns for either side. Poland is likely to keep Lukasz Fabianski in the goal as former Arsenal keeper Szczesny lacks match fitness having recovered from thigh injury. Jakub Blaszczykowsk has been involved in all of Poland’s goal in the tourmament so far scoring two and creating the other. Bartosz Kapustk is also available after sitting out in the last game with suspension. As far as Portugal is concerned they have a fully fit squad and Fernando Santos will have some selection headech as both Renato Sanches and Ricardo Quaresma came on as substitute to make major impact against Croatia. This will be the third time these two are meeting at the major tournament. Both has won game a piece in their previous encounters in World Cups. Since Fernando Santos took over as Portugal coach they are unbeaten in 11 competitive fixtures having but they have made a habit of winning games 1-0 as all 8 recent wins came with this scoreline. Ronaldo already became the player with most appearences in European Championship and he can become leading top scorer in tournament history with 1 more goal beating Platini’s record of 9. Match Predictions: Interestingly Poland are slightly favourite going into the match but you can never count out a team with Ronaldo in their ranks. They have not played the best football so far and got this far with alot of luck but if we go with the law of average they are due a good performance. It might just be this Thursday night and I can see Ronaldo getting that odd goal with Portugal advancing to semifinals with a narrow win.